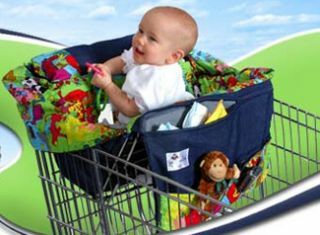 Buggy Bagg Shopping Cart Cover Discounts Apply ! Covers 100% of the seating area. Plush quilted fabric for the utmost comfort. Easy to install, inserts within 30 seconds. 4 elastic bottle cup holders. 1 large diaper bag section for wipes, diapers, toys, snacks ect. 2 smaller personal items compartments for keys, cell phone wallet. Protects your child from viruses, bacteria, & bodily fluids left on cart/high chair. Protects from environmental elements i.e cold seat bars. Chocla Aqua is currently on back order with the manufacturer. We do not have an estimated availability time yet. Please contact us if you would like to receive an email when these patterns are back in stock. *Free shipment will be by UPS ground. Please contact us to make other arrangements if you need it sooner. This item will ship separately from other items in your order.